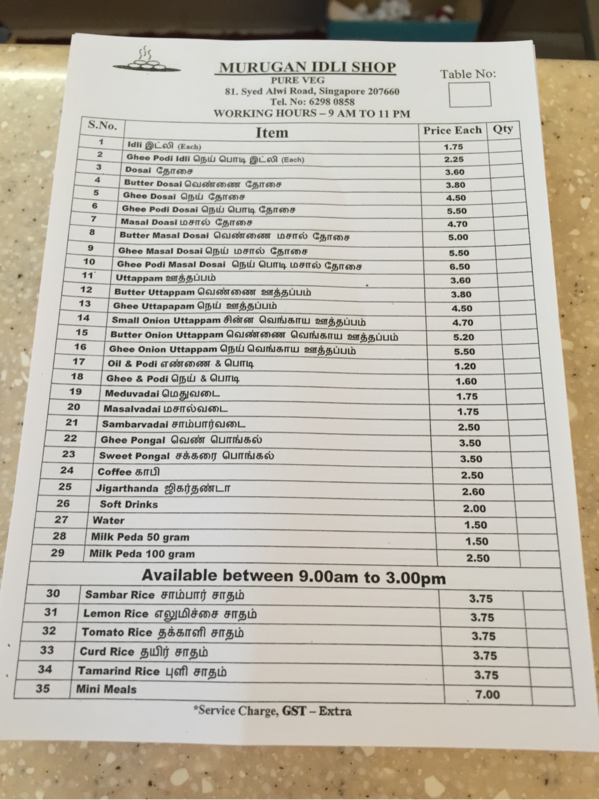 Quite a long overdue post, but about two weeks ago, I went with a good friend of mine to Murugan Idli! We had read about this place from hungryangmo.com and decided to give it a go since he had given it a really good review! Also, it was a vegetarian restaurant, which was perfect for us (my friend is vegetarian too)! Actually, I had never tried out Indian food before, other than prata, papadum and naan. So, being the adventurous person I am (okay fine, not exactly), we decided to give it a go! The interior of the shop is pretty simple, with simple festive decorations hung on the ceiling and posters of their signature dishes pasted on the walls. Their menu is probably fairly easy to understand for Indians or people who are familiar with Indian food. However, those who are here for the first time, not to worry! The pictures on the walls provide good illustrations of what you get. If you're still not too clear, you can ask the relatively friendly and helpful servers. Between the two of us, we ordered two masala thosais and two idlis. Only after we wiped off all the food and our bellies were completely stuffed, did we realise that we had over-ordered. 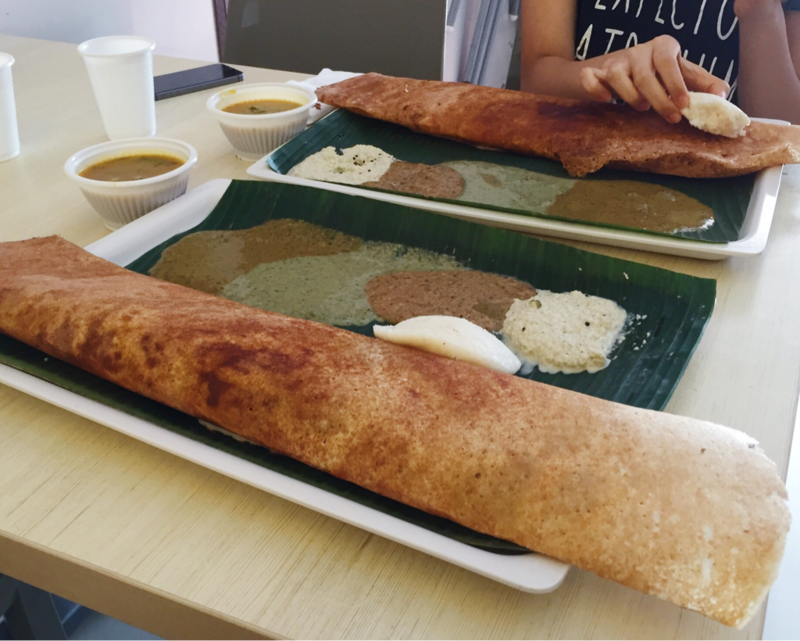 Considering the fact that both of us have pretty huge appetites and that we were both really full, I would suggest that the masala thosai can be shared between two people so as to not be stuffed silly. You could probably also another side dish to share. We were first given a tray with a banana leaf, with four different types of chutneys. I know the white one was a coconut chutney - my favourite. I wasn't too sure about the rest though, but I did like the one at the top left-hand corner as well. We were also given a bowl of curry, which was tasty, but not the best I've tried. There was cutlery provided the side of the table, but according to South Indian culture, the food is to be eaten from the banana leaf with your right hand, so we did not use any of the utensils (I, however, used a lot of serviettes). 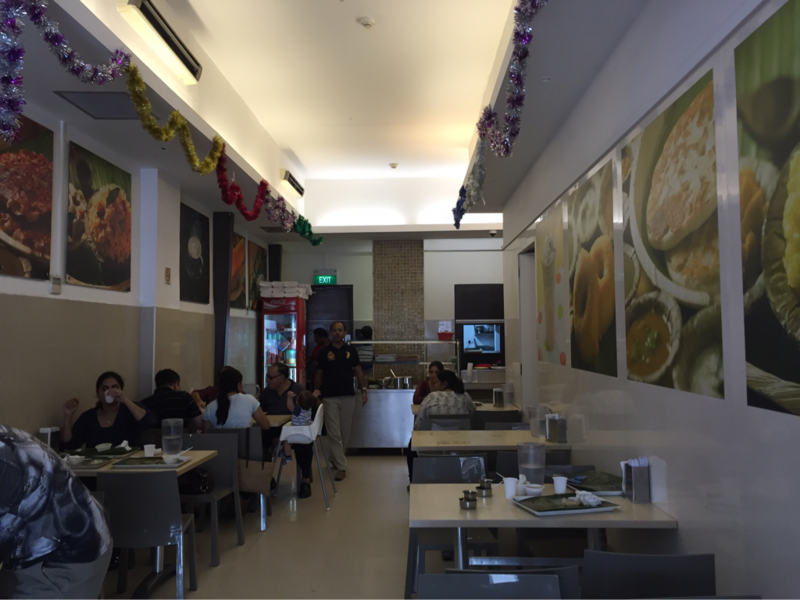 Since the shop is called Murugan Idli, we knew that we had to try out their idli. 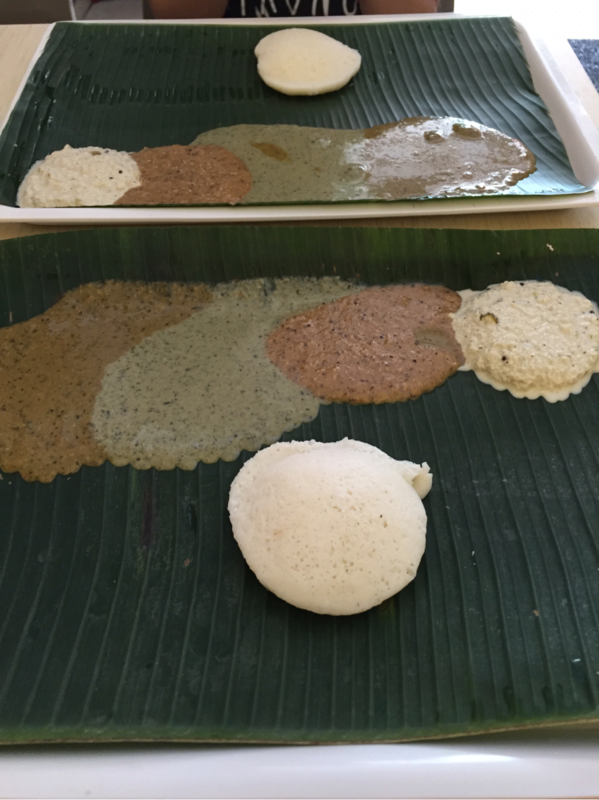 The idli came almost instantly upon ordering, hot and steaming. I don't know what they are made of, but they sure were bland. I loved the texture - soft and fluffy - but their flavour wasn't so appealing to me. Even when dipped in the wonderfully tasty chutneys, they still tasted awfully bland to me. Nevertheless, Murugan Idli may make the best idli around, but if you're someone like me who doesn't like idli, this dish just won't make the cut for you no matter what. Since HungryAngMo had given this a 10/10 rating and as soon I learnt that 'masala' meant curried potatoes (pohtato geddit geddit), I knew I had to give it a try. Originally, only one masala thosai came but we decided to wait for about 10 minutes before asking where the other one was and apparently they had forgotten about our second thosai so the first one had gotten cold by then... which was such a pity because food should be eaten warm, shouldn't it? But that's okay, because we were too paiseh to ask them to heat up the first one. 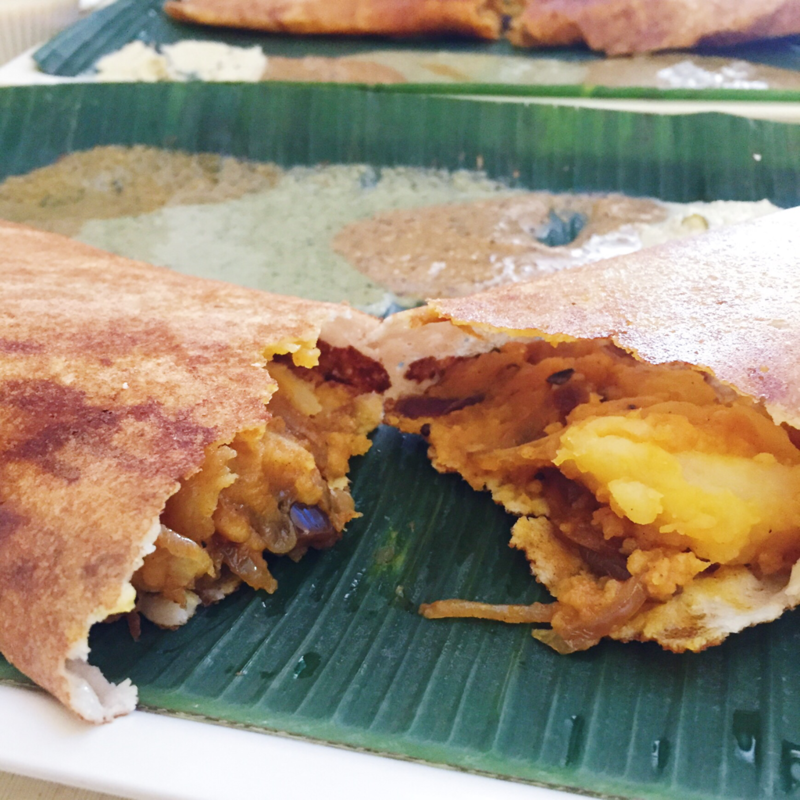 Anyway, when the second masala thosai finally came, we dug in. And it could be summarised into one word: MIND-BLOWING. 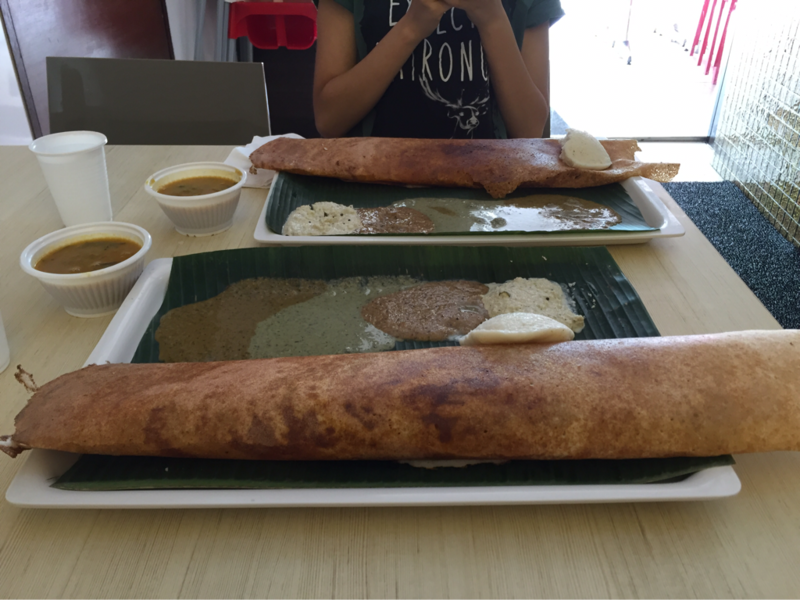 The thosai itself was light and crispy. When torn open, the steam escapes and the strong smell of curry hits your nose. 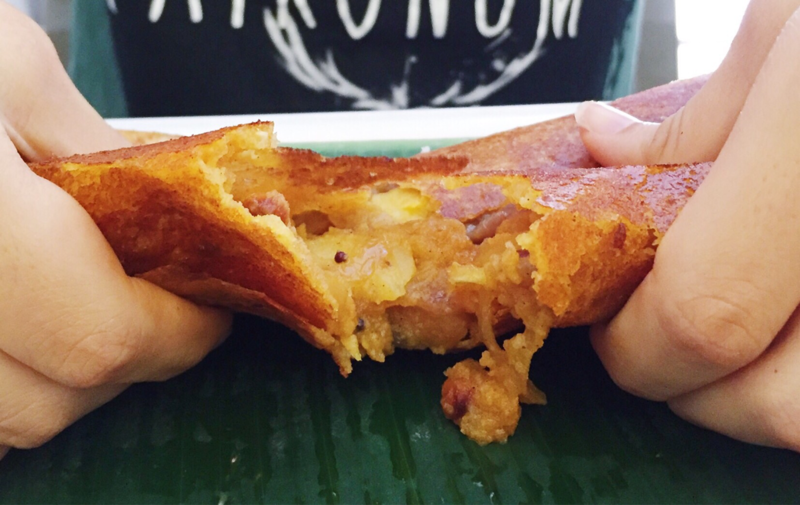 Yes, enclosed inside the crispy thosai is this wonderfully tasty and flavourful potato-onion-curry mash. And when I say mash, it isn't exactly literally a mash. IT. IS. FULL. OF. GIANT. POTATO CHUNKS. Yes, carbs on carbs. May seem like a diet nightmare for some, especially those on low-carb diets. But not me man, I love me my carbs. GIVE ME ALL MY CARBS AND YOU'LL BE MY BEST FRIEND. FOR LIFE. Literally, without even bothering to chop up the potato into smaller pieces, dumps the whole potato inside the thosai - much to my delight. 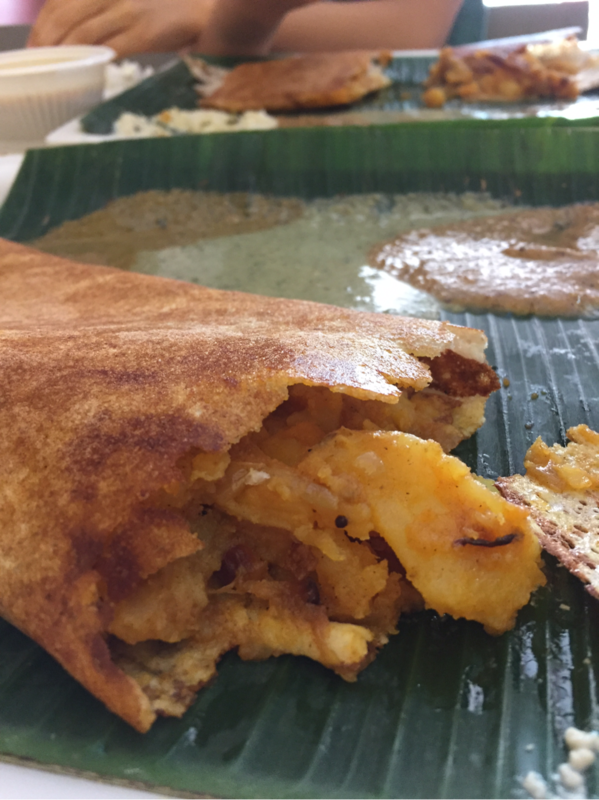 I feel that the combination of the thosai, together with the masala oniony starchy filling, is sufficient to BLOW YOUR MIND. Okay, this review may not have been very descriptive because I'm mainly spazzing about how amazing this was but yes, you get the point. My first Southern Indian food experience was a wonderful one thanks to Murugan Idli. Can't wait to try out masala thosais and compare them to the one I had here. But thus far, I must say that this is the best masala thosai (though it's the one and only) I have ever tried in my entire 16 years on this earth. I kid you not. 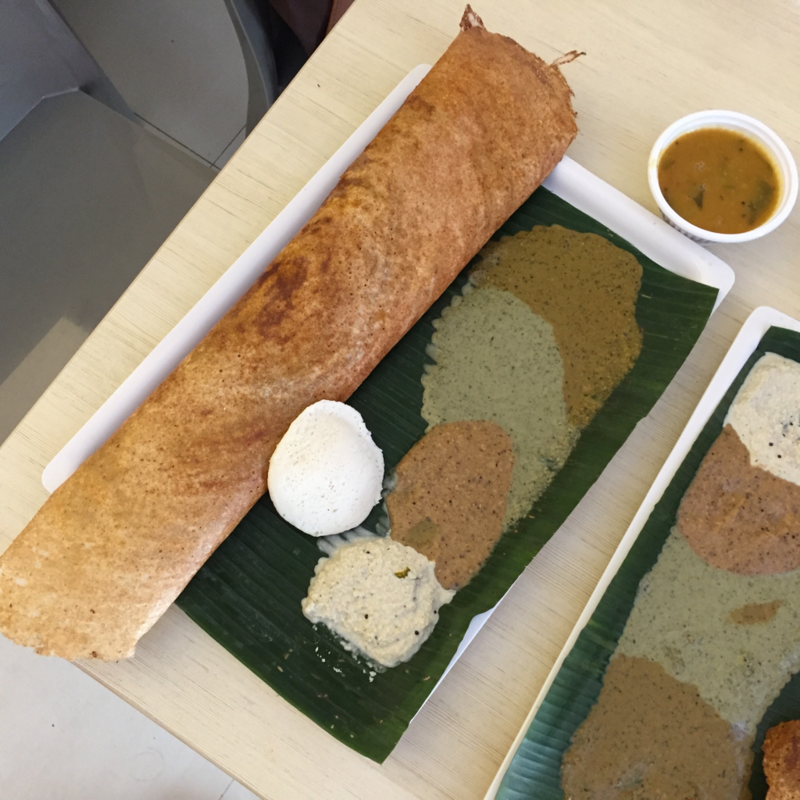 Please come to Murugan Idli and try their masala thosai and tell me what you think!